A product enjoying a good share of positive reviews from users, CVS Menopause Support Extra Strength seems to be a reliable supplement for fighting and relieving the symptoms of menopause, such as hot flashes, insomnia and irritability. The product is conceived as a holistic treatment for aging women that they can take every day, without a doctor’s prescription. Let’s see what the product is made of, and how exactly intends to alleviate the side effects experienced by many women during the onset of menopause. What Does CVS Menopause Support Extra Strength Contain? We notice the use of black cohosh, one of the best natural remedies for treating hot flashes caused by menopause. We also see that isoflavones and enzymes are used to create a powerful formula. Essential nutrients, minerals and vitamins, are present as well, but not all are targeted at treating menopause symptoms. The product caters to heart health, healthy bones, and for combating symptoms like mood swings and hot flashes. The recommended dosage is one caplet daily. The price for a bottle with 28 caplets is 15.99USD, which is quite reasonable for such a product. The company selling CVS Menopause Support Extra Strength offers 30 days money back guarantee for natural supplements. It is always good to see a product that tries to address multiple issues through a clever combination of nutrients and herbal remedies. CVS Menopause Support Extra Strength seems to be such a product, and the positive reviews from users support this conclusion. The manufacturer claims that the first effects can be felt in as little as one week, and you can take this product for a long time. 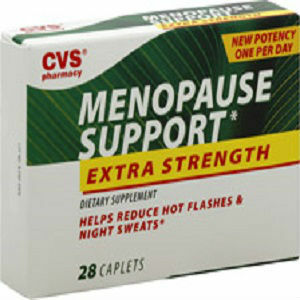 Jackie Horowitz	reviewed CVS Menopause Support	on April 10th	 and gave it a rating of 3.